In the late 1870's Albert Frye constructed a crude sawmill in the upper reaches of what came to be known as Frye Canyon. Powered by two mules harnessed to a sweep pole, the Frye Sawmill provided lumber to the citizens of the Gila Valley below. Frye managed to construct a wagon road to his sawmill in this rugged country, before eventually selling his sawmill to Hans Chlarson. The Chlarson family updated the sawmill to steam power, and lived in the canyon during the summers. In time they improved the rough wagon road, and operated a boarding house in Frye Canyon for summer visitors. 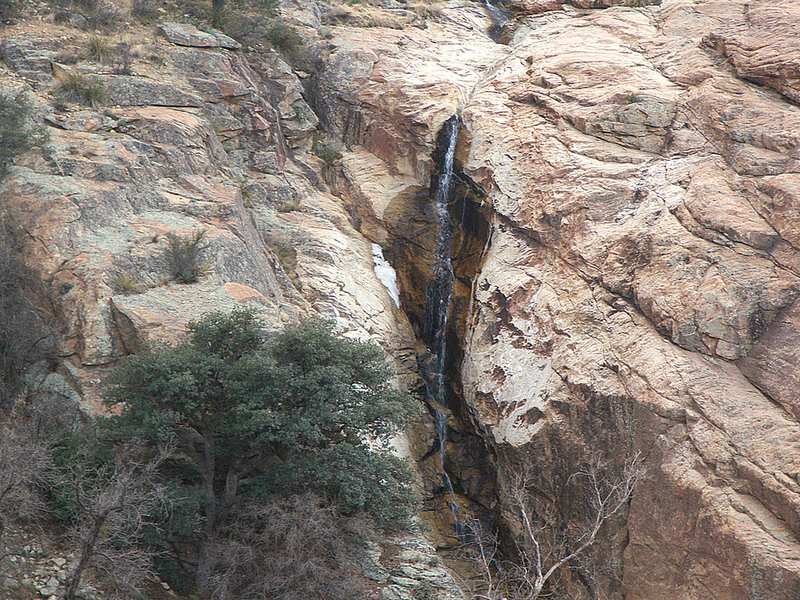 The forest service also made use of Frye Canyon, and established an early ranger station known as "Inception" near the junction of the Frye Canyon and Round The Mountain Trails. 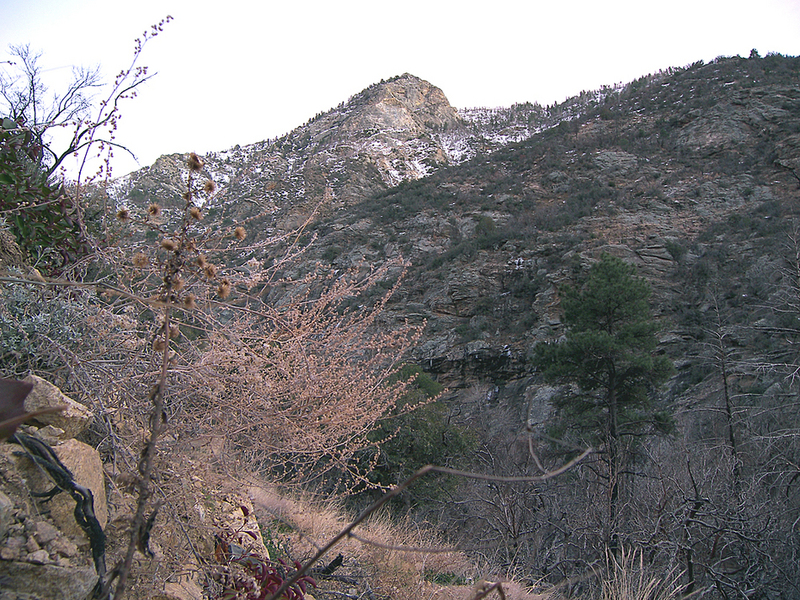 In the early twentieth century, the forest service also used Frye Canyon as a tree nursery for replanting previously logged areas in the Pinaleno Mountains. 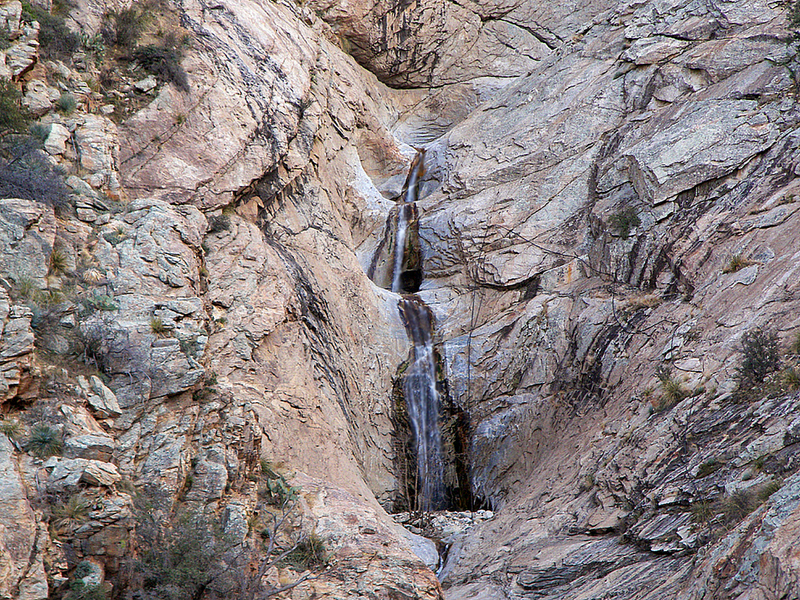 The Frye Canyon Trail follows the historic sawmill road past waterfalls and lofty peaks, on the north side of Mt. Graham itself. The 2004 Nuttall Fire scorched a large part of this canyon, leaving blackened poles and fallen trees where once a beautiful pine-fir forest had existed. Today, all is quiet in the canyon except for the constant roar of the waterfalls and the birds that make this canyon their home. Frye Mesa Reservoir makes a fine place to begin the hike, as the last half mile of road up to the official trailhead is an incredibly rough 4x4 journey. Beginning at the Frye Mesa Reservoir parking area, follow the increasingly rough road up the mountainside. After 0.67 miles you will arrive at a metal gate that marks the end of the road. Off to your left, Frye Creek forms a cascading waterfall as it erupts from the massive cliffs of pale metamorphic rock above. Another (possibly seasonal) waterfall is off to your right. As you follow the unsigned trail beyond the gate, you will cross over a couple washed out creek crossings before climbing up and around a brushy hill overlooking the Gila Valley in the distance. At the top of this hill the oaks and junipers give way to a pine-fir forest as the trail drops down to the bottom, and then crosses Frye Creek. Now on the east side of Frye Creek, the trail continues to follow the old wagon road, and soon enters the Nuttall burn. The remains of a rock wall are passed in this area, as well as what appears to be the remnants of an old gaging station. 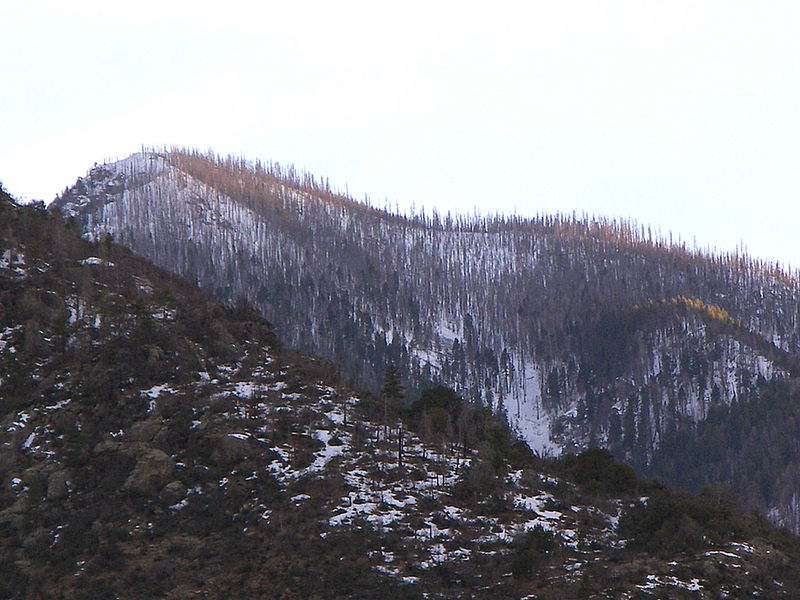 Much of the trail from here on up has been obliterated due to the after effects of the Nuttall Fire. Fallen trees, matts of dead weeds and erosion from Frye Creek make this stretch of the Frye Canyon Trail an adventure in route finding. Someone's occasional red marker tape simplifies this job somewhat; trust the route shown on the 7.5 minute Mt. Graham topo map. At around 1.7 miles the trail crosses to the west side of the creek and climbs the slope a little to bypass some sheer canyon walls below. The cliffs of 8100 foot Trap Peak loom high above you as the trail rounds a corner. The trail soon redeposits you back into the creek bottom, where it remains for most of the next mile. Above you to the south is the 10,720 foot peak of Mt. Graham itself. To its right lie the incredibly rugged cliffs of upper Frye Canyon. Only occasional patches of forest survived the Nuttall Fire in this area; one can only imagine how beautiful this hidden valley must have once been. The Frye Canyon Trail begins a short climb up the east wall of the canyon before coming to an end at the Round The Mountain Trail. Somewhere in this area is the site of the long abandoned forest service ranger station known as Inception. Check out the Round The Mountain Trail, or return the way you came. From the highway 70/highway 191 junction in Safford, head west on highway 70 for 3.75 miles to Reay Lane in Thatcher, AZ. Turn south onto Reay Lane (milepost 335.65) and follow it for 1.2 miles. At the 1.2 mile point, there will be an unmarked dirt road to the right (west) just before the auto wrecking yard. Turn right (west) onto this dirt road, it is forest road 103. Follow forest road 103 for about 7.9 miles to a parking area just above Frye Mesa Reservoir (you will see a Coronado National Forest sign at 7.6 miles). Start hiking up forest road 103 at this point, or drive another 0.67 miles up the now nasty 4x4 road to the "official" trailhead.